Wendy’s advertises, in its latest spot, the new Made to Crave menu, which introduces a trio of cheeseburgers to the “fresh, never frozen beef” family. The commercial features the Barbeque Cheeseburger, the Peppercorn Mushroom Melt, and the S’Awesome Bacon Cheeseburger. “If your world is full of same old lame old hamburgers, hit reset. Because Wendy’s made a whole new world with the new Made to Crave menu, featuring the Peppercorn Mushroom Melt, with savory mushrooms, the Barbeque Cheeseburger, with sweet and smoky barbecue sauce, and the S’Awesome Bacon Cheeseburger, with bacon for days. 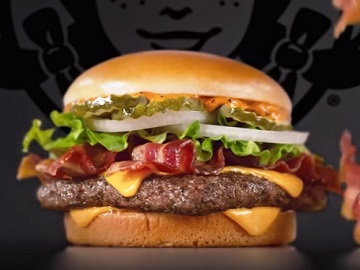 It’s your world now and Wendy’s just rocking it,” the voiceover says, urging viewers to try the three new hamburgers on the Made to Crave menu today. According to the fast-food restaurant chain, the Peppercorn Mushroom Melt (with a recommended price set at $5.29) features white mushrooms that are grown and handpicked in the U.S., sautéed, fire-roasted and seasoned, crispy fried onions, a slice of natural Asiago cheese and fresh, never frozen beef, and smoked peppercorn aioli (which is made with cracked peppercorn, fresh garlic and has underlying tones of mushrooms). The Barbecue Cheeseburger (with a recommended price set at $4.79) features two slices of American cheese, crispy fried onions, three juicy pickles, fresh, never frozen beef, and a topping of sweet and smoky Kansas City-style barbecue sauce. The S’Awesome Bacon Cheeseburger (with a recommended price set at $5.29) features fresh, never frozen beef, two slices of American cheese, three strips of sizzling Applewood smoked bacon, iceberg lettuce, sweet onions, pickles, and Wendy’s Side of S’Awesome sauce, all served between a warm and fluffy premium bun.